Have you seen this? I'm sure it's not brand new and I heard that whole foods was contemplating (or testing) a "spa" or "give us your grocery list and we'll shop for you while you get a massage" but this is the first "proof" I've seen about it. What does this say? Well, they've identified their ideal client and know they like massage... That massage is now a household word... I think it kind of devalues what we do though, maybe? "Who Loves Ya?" -Christopher P.S. Share your thoughts below please via facebook (or below that via this blog). I agree with Suzanne. It’s probably just a local therapist and also that chair massage is about as far as you can get from a spa. Also, that it’s not bad for the industry. Your first taste of massage is never your last…..
REALLY – Are you serious??? This is not new. It’s been going on for years – at ALL of the natural food stores in our area of Dallas, including Whole Foods. 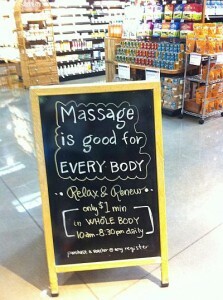 In fact, until a couple of years ago, one of our Whole Foods here not only had massage therapy but a nice spa located upstairs. They were in business probably about the same amount of time, 2-3 years but eventually that part of the store closed, I guess not enough business. No, I don’t think it devalues the industry at all. In fact, the spa that WF had here was actually quite nice, upscale in the same kind of neighborhood. They were like any other spa here. So no Joy and Suzanne, if it’s a spa this is probably not just an independent local LMT. Next post: Need a Unique Hair Product?